Use ipsensor (intelligent Power Sensor) to measure active power, current, voltage and frequency of single loads in low voltage systems. Manage your actions easily within your energy management system to improve the energy efficiency or to minimize the down times by preventive maintenance / service. ipsensor uses the wires in low voltage distribution boards for measuring, for example on the fuses in control cabinets. The system concept guarantees an optimal cost-value ratio through 1%-measuring accuracy, easy installation in retrofit or new installations and very low internal energy consumption. The modular system consists of one base unit (ipsensor Base) and one or more sensors (ipsensor 3, 12). The sensors contain several metering points to measure the active power of the single loads. You can connect up to 120 metering points by ribbon cable to the base unit with flexible distances. The very fast bus system supports the individual assignment of the correct phase to each individual current metering point, to enable the calculation of the power values. 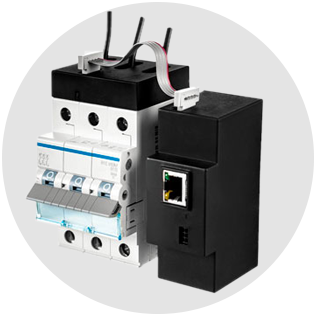 The base unit is mounted on a DIN rail, the sensors are mounted on the fuses or similar devices. 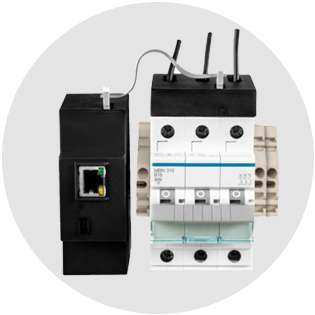 The metered values are read out by modbus protocol (TCP / RTU). You can integrate ipsensor with the ipsensor service tool in your system environment fastly and without any programming knowledge. Preconfigured interface modules are available for a variety of software systems.